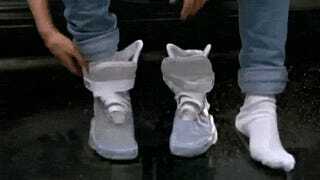 Did you ever dream of having Marty McFly's Nike powerlace shoes from Back to the Future Part II? Well, if all goes according to plan you might get your chance to own a pair. Nike reportedly has plans to release some version of the MAG shoes sometime this year. But they're not saying precisely when. According to shoe blog Nice Kicks, Tinker Hatfield a designer at Nike, confirmed at a conference in Long Beach on Monday that they were working on the shoes. Hatfield has been promising that the shoes would eventually be released to the general public ever since early 2014. But he's got less than 12 months to go for a 2015 release. And he's certainly feeling the heat from BTTF2 nerds. Nice Kicks quotes Hatfield as saying that there's "11 and two-thirds months left in 2015." No pressure or anything. Various versions of the shoes (official and unofficial) have been released in recent years, but none have had fully functional powerlace technology. They might look cool, but they're not the shoes we were promised for 2015. So will Nike's new shoes include fully functional powerlaces? They'd like them to! The biggest hurdle for powerlace technology is the power. Strapping a huge battery sufficient to make a pair of shoes self-lacing is both a design challenge and likely cost prohibitive.